Among the world’s healthiest of foods is the cranberry — packed with phytonutrients that offer antioxidant, anti-inflammatory, and anti-cancer health benefits. Cranberries are a very good source of vitamin C, dietary fiber and manganese, as well as a good source of vitamin E, vitamin K, copper and pantothenic acid. I couldn’t find quite as much to say about the sugar that is also added in this recipe, but the effect is phyto-terrific. These guys literally POP in your mouth — bet ya can’t eat just one! — and I bet they will become a family holiday favorite. – Combine granulated sugar and water in a small sauce pan over low heat, stirring mixture until sugar dissolves. Bring to a simmer; remove from heat. (Do not boil or the cranberries may pop when added.) Stir in cranberries; pour mixture into a bowl. Cover and refrigerate 8 hours or overnight. – Place superfine sugar in a jelly-roll or rimmed pan and add the cranberries in small amounts, rolling to coat with the sugar. 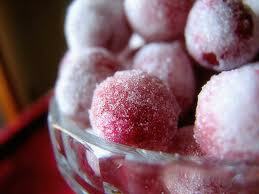 – Spread sugared cranberries in a single layer on a baking sheet; let stand at room temperature 1 hour or until dry. – Set out or store in an airtight container in a cool place for up to a week.